It is time to listen up and notice! I would assume that the vast majority of physical therapists in an outpatient environment have not really taken the time to read through many of their payment contracts with insurance companies. Why do I assume this? I was one of you until I got burned a number of years ago. There was a simple statement in a contract that provided me with a flat per visit rate. The rate was acceptable to me; however, that was not what I was paid. Elsewhere in the agreement there was a section that described the administrative fees. As it turned out, this contract was not with an insurance company at all; it was with a third party who administrated claims on behalf of many insurance companies. The net result was that I was now going to receive a discount from a multitude of payers from which I was already being paid a contract rate! 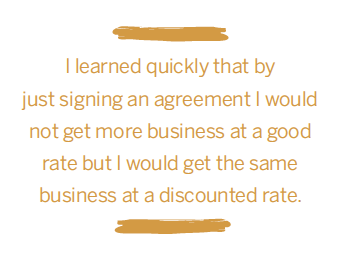 I learned quickly that by just signing an agreement I would not get more business at a good rate but I would get the same business at a discounted rate. Thus my interest in payer contracts and contract negotiations began. A physical therapist should be able to review a contract and get an overall sense if it offers beneficial terms. The contract goes beyond what you will be paid for your services. Recently many of us have been offered contracts that insert themselves between the provider and the payer as a third party administrator (TPA). The TPA may provide a service to the payer by managing their network, credentialing providers, and controlling utilization. Unlike the provider networks that represent therapists in negotiating contracts with payers, these networks work for the benefit of the payers and themselves. One would think that the payer would pay a nice sum to provide these services. In reality they often offer to provide these services to the payer and save them money. How do they accomplish this? They lower their payments to the providers and control the number of visits a patient might receive. In effect, when you participate with one of these entities you are agreeing to sign a secondary contract that reduces your payment and visits more than your primary agreement with a payer. You are agreeing to allow this TPA to insert themselves between you, the patient, and your referral source in the medical management of your patient. Why do we do this? One explanation is that we fear that by not signing the contract we will lose business. That might be true but if all of your payers adopt this new rate, would you survive? There are some simple things that you should do before signing such an agreement. I recommend that you have an attorney review the contract if the language is not clear to you. If you do not know what it costs you to deliver care, then it will be virtually impossible to know if the terms being offered by the payer would be favorable for your practice. The easiest calculation of costs can be done on a per visit basis. In the private practice environment it is a simple calculation of your total annual costs divided by your annual visits. It is important to include the normalized compensation of the owner as part of your costs. Normalized compensation removes the added bonus or distributions that you pay yourself in addition to a salary. As an example, if your annual practice costs are $625,000 and you perform 9,300 visits per year, your cost per visit would be $67.20 per visit. That should give you an idea of where you should price your services when negotiating a contract with reimbursement based on a typical visit. If you are capable of providing more visits without increasing your costs, then you will see your cost per visit drop. The goal would be to build in a profit margin above and beyond your cost to derive a profit. Compare the initial proposed payment with your cost plus an expected profit margin. Note that some payment scenarios are complex and may not provide you with language that is clear enough to determine your exact payment. One way to approach this is to present a typical patient bill to the payer and ask them to price the payment. It is far more challenging to establish your cost per visit in an institutional setting. If your employer provides profit and loss statements by cost center, you have some ability to perform the calculations as you would in a private practice. If these numbers are not available, you may be able to request the allocation of indirect costs for your department. This along with an idea of staffing, benefit, and supply costs may provide enough information to make an estimate of your costs per visit. If you are reviewing an outpatient contract, then only include the space and overhead devoted to outpatient services. Referral sources that are currently sending you patients. Are you missing out on additional patients from this referral source because you do not have a contract? 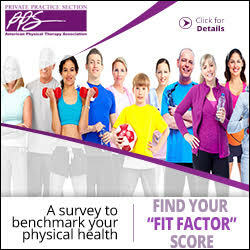 Who are the other physical therapists on the panel and do they currently compete with you? How many of your current referral sources are not listed? You may want to contact them to see if they plan to obtain a contract with the payer. How many potentially new referral sources are listed? Will signing the agreement allow you access to these patients? In addition to this information you should ask the payer to provide you with enrollment data for zip codes in your market area. You should also ask which employers offer their insurance to their employees. You cannot rely solely on residents in your community as targeted patients. Often individuals seek care close to work even though they live outside of your market. Assignment of the Agreement: Can the contract and payment terms be applied to any other payer without your consent? If so, the discount that you just accepted can be applied to other payers who may currently be paying you at a higher rate. By signing you may have just discounted a majority of your business. Provider Tiers: Does the contract allow for you to be placed in a tier level? If so, know your initial placement and the criteria used to gain a more or less favorable position. Tier levels are often determined solely on utilization. The tier may require you to submit paperwork after the initial evaluation to get approval for additional visits. It is rare to see a tier system that pays you more and allows for more visits based on your outcomes versus utilization. Fee Schedule: Is the fee schedule an addendum or attachment to the contract or is it found in the body of the agreement? 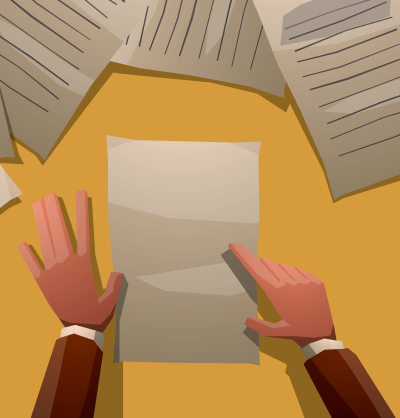 Many contracts allow the payer to modify an attachment without your approval. This would mean that the contract rates could be decreased without you having the ability to renegotiate. Understand your rights for renegotiating rates. Definition of Covered Services: Are there exclusions for services that you provide? Most contracts require you to bill using current procedural terminology (CPT) codes. If specific codes are not covered, they can reduce a per visit or per diem rate accordingly. Definition of Medical Necessity: Who establishes medical necessity and what type of professional (or nonprofessional) handles the appeal process? Out of Network Benefits: Find out what the out of network benefits are. You might find that you are better served by seeing these patients and balance billing them. Payers may not be easy to negotiate with, but you should always attempt to seek payment that is commensurate with the resources provided. This may require that you explain why your practice requires a higher rate. Highlight the unique skills of your staff, therapist-to-patient ratio, unique services and programs, and type of documentation. This may get you nowhere but do not be surprised if they come back with a higher rate. A couple dollars per visit may be a true victory with some payers. Contracts have a term duration. It is common for contracts to just roll over from year to year; however, it is at this rollover date that you usually have a window to renegotiate the contract or cancel it. If it is bad for you, then it might be bad for all of us. Unless you are in a desperate situation where you need business at any price to survive, it is best to walk away from a proposal that does not meet your rate requirements or sends up red flags on other contract points. In effect, contracts and networks turn a discounted service fee (negotiated between an individual provider and a specific insurance company) into the usual and customary fee for the entire physical therapy industry. Every clinic owner is at risk of experiencing additional payment reductions, and this is largely because when many providers accept low rates the outcome is felt throughout the profession. A payer network must provide adequate coverage to the enrollees in order to fulfill its legal obligation in the State of California, for example. When insurance carriers cannot present a viable provider network, it presents the opportunity for individual practices to negotiate fair and appropriate payment for services with other nonpredatory networks. If you are unsure of how a contract will impact your practice, then seek advice. I have been told more than once that the terms of the contract are nonnegotiable. 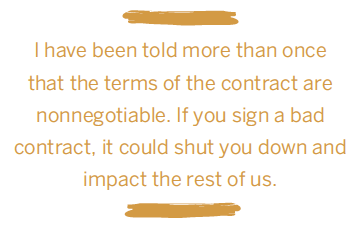 If you sign a bad contract, it could shut you down and impact the rest of us. Resources are available within the American Physical Therapy Association (APTA), most state chapters, and the Private Practice Section (PPS) websites to assist you. A good contract may contribute to the success of your business. Pay attention to your contracts! Rick Katz, PT, DPT, MA, is the president and chief executive officer of Adient Physical Therapy, which operates clinics in Alaska, Arizona, California, and Oregon. He serves as the chairperson for the California Physical Therapy Association’s Payment Policy Committee, is a member of the Finance Committee, and also serves on the Private Practice Section’s Payment Policy Committee.